The home is open plan, which allows the light cooling breezes from the sea to circulate the home, with lounge, dining area. European kitchen, and three large double bedrooms all en-suite. The lounge, which is air-conditioned, has double patio doors leading to both the front & rear terraces, and is furnished with 3 large very comfortable sofas, a beautiful light oak wall unit with matching coffee & lamp tables, 2 table lamps & large screen LCD satellite TV & DVD player. The dining area, which is air-conditioned, is adjacent to the kitchen and has a large table in the style of a breakfast bar with 6 matching dining chairs and patio doors leading to the rear terrace. The European style kitchen has many cupboards and drawers, a large worktop, & is fitted with an oven, hob, extractor fan, built-in washer & dishwasher, and a large fridge freezer. There is also a toaster, an electric hot water jug, an electric kettle, a coffee maker, plus an iron, ironing board & vacuum. The kitchen has double patio doors opening onto the back terrace. The master bedroom, which is air conditioned, contains a king bed, a triple Bali style wardrobe with matching vanity unit, chest of drawers, bedside tables, lamps, a cabinet for the 42" LCD TV with DVD/CD player. Leading from the room is a large en- suite bathroom with rain & soft shower, a vanity sink with mirror & a wc. Double patio doors lead to the rear terrace & swimming pool/spa. Bedrooms 2 & 3 are also air conditioned, very spacious & both contain king beds, double wardrobes, vanity units & cabinets displaying TVs for playing DVDs & CDs from the DVD players provided. Both rooms have en-suite facilities incorporating rain & soft showers, vanity sink units with mirrors & WC's. Each of these bedrooms have double patio doors leading out to the front terrace. All bedrooms have blackout curtains ensuring daylight does not interrupt your sleep. There is a storage cupboard situated off the lounge, for ironing board, vacuum etc. & this also houses an electronic safe for your valuables. The villa is set in a large plot with superb gardens and many tropical bushes and flowers. There is a large 10x3 metre covered front terrace which is raised above the garden to provide excellent views of the large fish pond. The pond runs the width of the home and contains many water plants within and tropical plants surrounding it. On the terrace there is a Thai style marble type dining table with matching bench seating, 2 x sofas, 2 x chairs & drinks tables. To the side is a large car port and a garden planted with beautiful and various coloured Bougainvillea. To the rear of the villa is another large covered terrace 6x4 metres, with a dining table & 6 chairs, 2 x large sofas & matching coffee table. This overlooks and leads to the pool, spa & sun deck area with 6 sun loungers. The whole house is surrounded with a 1.8 metre wall and the boundaries have been planted with fragrant bushes & palm trees to provide privacy. 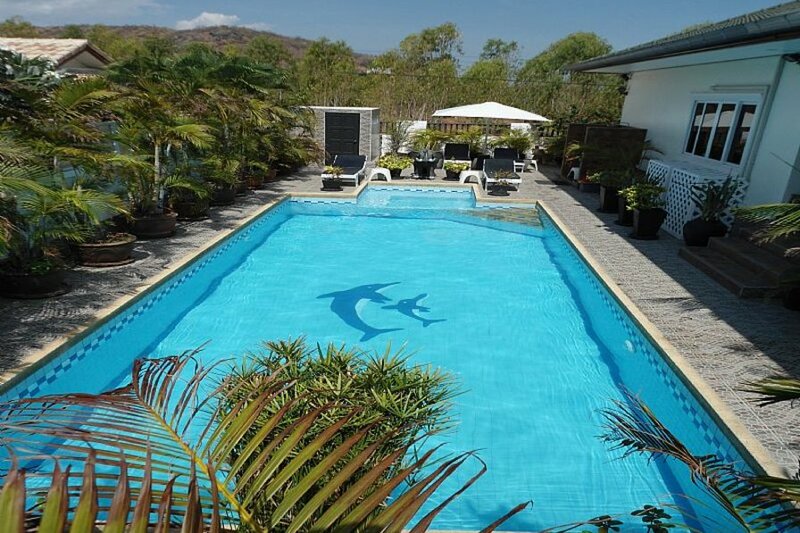 The 10x4 metre private salt water swimming pool is 1.5 metres deep & the attached spa is 2x2 metres square.This provides a haven for cooling off, relaxing ,or some serious exercise. There is also a large outsider rain shower adjacent to the pool. On site clubhouse with restaurant, gym, internet, large communal pool & spa, which you have full complimentary use of during your stay. Villa cleaning and bed change every 7 days. A meet & greet service at the villa. 40 units of electricity a day. From the rear terrace there are mountain views to the west, where you can watch the sun set over them, and from the front terrace you will get uninterrupted east views towards the sea and enjoy the refreshing cooling breezes coming up from it. We are about 6 kilometers north of Hua Hin centre, which is easily & cheaply accessible by Taxi or Tuk-Tuk, but if you need maximum flexibility we would suggest Car or Motorbike hire as you will need some form of transport to go to the shops, town etc.